Our new page, Page 220, shows the inside of the Nazi hideout. I don’t speak German, and I used Google translate to write the German dialogue, so if anyone notices any glaring errors, let me know. Remember last week’s blog post? That one was so long! I had a lot of stuff to say about the planning of Page 219. I don’t have much to say about the process behind Page 220, except to note that it’s setting the stage for our eagerly-awaited Electric Team vs. Nazis fight. 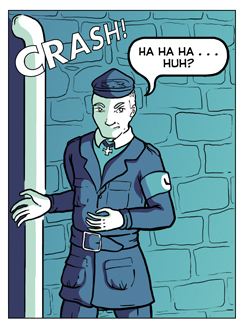 Also, Sam did a good job drawing the smarmy Nazi officer. Spoiler Warning: That guy’s going to get punched in the face soon.